In order to properly configure DataKeeper in a shared volume configuration, use the DataKeeper GUI to connect to all systems where the shared volumes are configured. When connected, the DataKeeper GUI uses hardware signatures to automatically detect which volumes are shared and which are not. Important: If the GUI is not connected to a system, the GUI cannot detect shared volumes on that system. Note: DataKeeper allows mirrors to be created on shared volumes where more than one system has access to the same physical storage. To prevent simultaneous access, see Safe Creation of a Shared-Storage Volume Resource prior to performing the following steps. Connect to all systems via the DataKeeper GUI. Define a job name and job description and select Create Job. The Choose a Source dialog box appears. 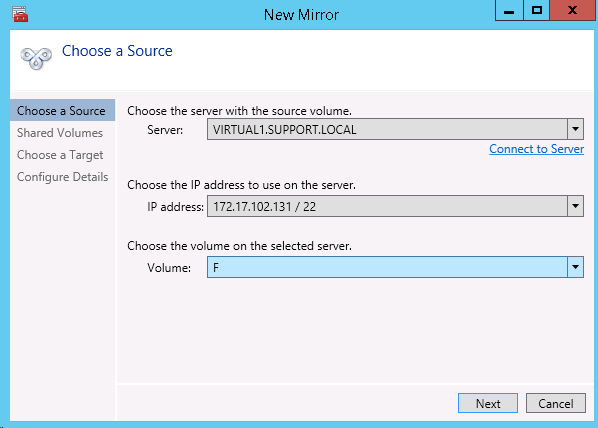 Choose a Source System, IP Address and Volume. Select Next. The Shared Volumes dialog box appears. Choose the systems that have volumes which are shared with the source system. Note: All systems connected to the shared volumes must be configured with IP addresses on the same subnet. The Next button will not be enabled until all included systems have a valid IP address. While it is possible to uncheck the Include box for a given system, the user should be very careful to make sure that the volume listed really is not a shared volume. It is possible (although unlikely) that the hardware signatures of two volumes will match even if they are not shared. In this case, it is valid for the user to uncheck the Include box. Select Next. The Choose a Target dialog box appears. Choose a Target System, IP Address and Volume. Note: If there are volumes on other systems that are shared with this target volume, the Shared Volumes dialog will appear next. 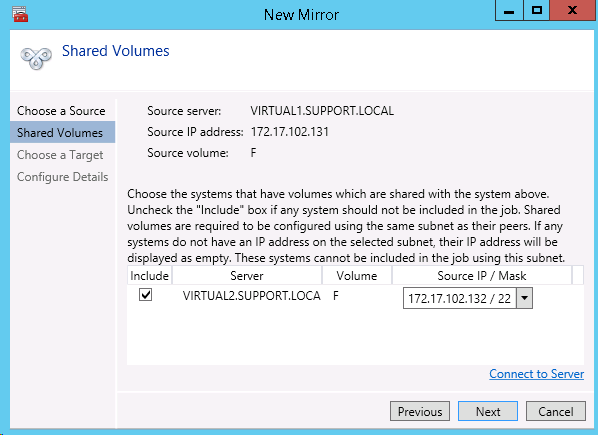 Configure these shared target volumes as you would for shared source volumes, described above. Select Next to continue. The Configure Details dialog box appears. Use the slide bar to set the data compression level for data sent from the source to the target system. Note: Compression is only recommended to be used when replicating across WAN connections. If you wish to limit the amount of bandwidth used by replication, enter the maximum bandwidth for transmission; otherwise leave the default setting. Select Done. The job with the new mirror will appear in the left tree pane and the main window displays.